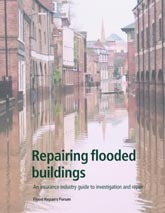 A set of four guides (4 pages in each part) dealing with repairs to damage caused by flooding. - Part 1. Immediate action. Part 2. Ground floors and basements. Part 3. Foundations and walls. Part 4. Services, secondary elements, finishes, fittings. - External flooding may immerse parts of a building for several hours, but even a few hours can lead to drying times of several weeks. Part 1 gives advice on cleaning the building during the first few days after the floodwater has receded: such action can reduce the reoccupation time and minimise repairs and replacement. Part 2 deals with the treatment and repair of floors, and the draining of under floor areas and basements. The type of floor is significant as flooding affects floor constructions in different ways. Older and new types of floors: suspended timber, concrete on the ground and suspended concrete (including those containing insulation). Information on drying, ventilation, measuring moisture contents, and reinstatement of flooring, is dealt with in conjunction with the appropriate floors. Part 3 covers the treatment and repair of foundations and walls, which have been affected by flooding. The type of wall will be significant as water affects wall materials in different ways. This advice is given for wall constructions in general use: solid walls, cavity walls, timber-frame walls and non-traditional walls. Information on different wall finishes: plaster on lathing, plaster on masonry and plasterboard, are dealt with in conjunction with the appropriate wall types. Part 4 gives advice on the equipment, internal partitions, doors, windows and fittings such as kitchen units in a building damaged by flood. It deals with the period after the initial cleaning, inspection, drying and repair of each item. Priorities are included to achieve early occupancy of the building. 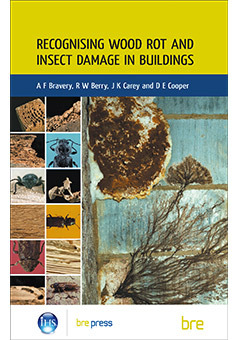 Much of the advice applies also to damage caused by burst pipes, leaks and storm damage.